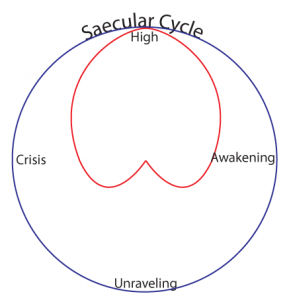 The cycles of our society are similar to all natural cycles. Understanding them gives insight into our future direction. 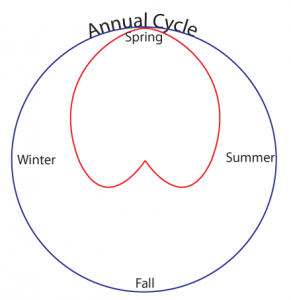 The high and low represented in this chart are the actual seasons, Spring, Summer, Winter and Fall. 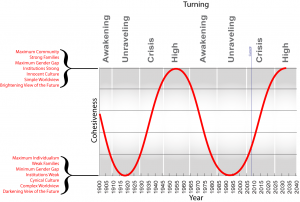 Those fit inside of the generational cycle and are shown in the “magnified” portion of the chart. 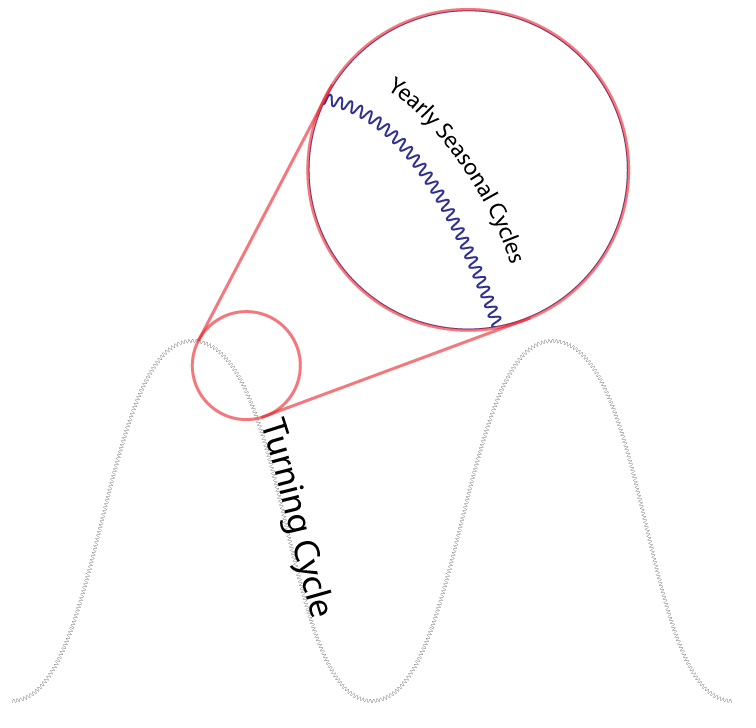 The point is that there are cycles within cycles. 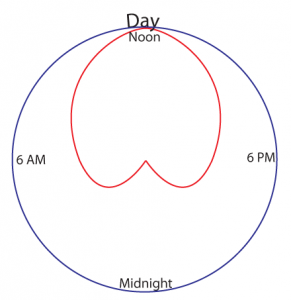 This shows the 24 hours of the day, with high noon at the top, and Midnight at the bottom. 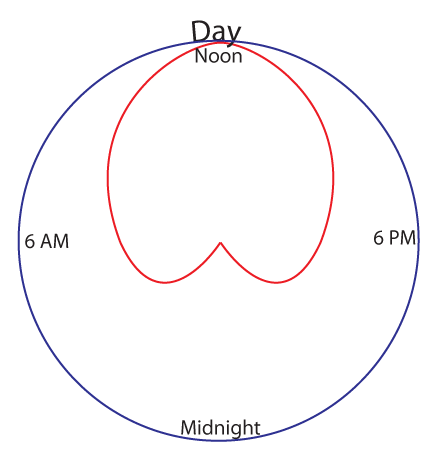 The red line in the center represents the “high” (Noon) and “low” (Midnight) of the day. 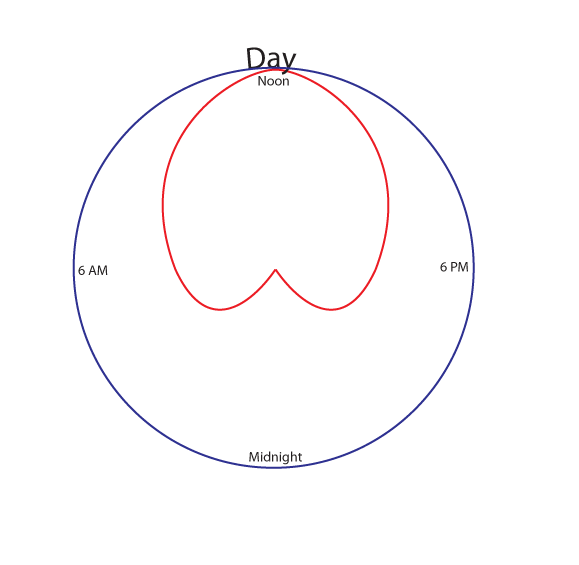 When the red line meets the outer circle it is the high point of the day, and when it hits the middle of the circle it is the low. It is interesting how this cycle turns into a heart shape on a circular chart (I think there is some name given to that type of shape on a circle). 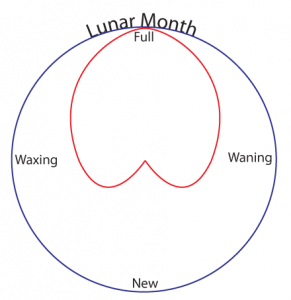 If we start at the top we have the Full moon, then the Waning moon, New moon, Waxing moon and then returning to the Full moon. Again the red line represents the “high” and the “low” of the cycle. As we can see, this pattern can repeat multiple times as we go further and further out. 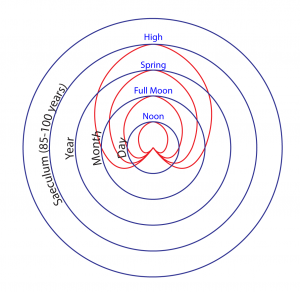 These are all natural cycles that definitely affect even our modern society (most people do sleep at night and get outside more in the Summer). 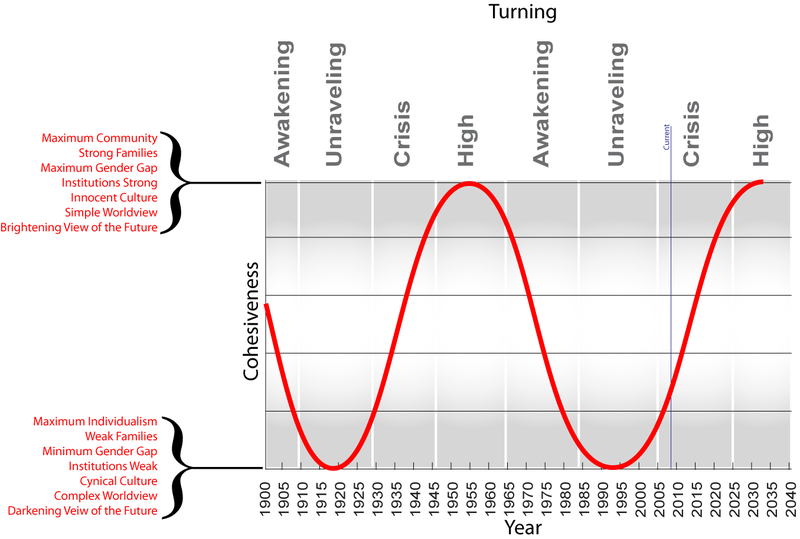 Often we don’t realize just how much these cycles affect us (see my post on linear thinking), but they that does not lessen their effect. 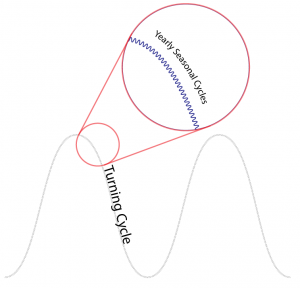 The turnings are a natural cycle as well because they are based on a natural phenomenon (a human lifetime). So here is the big question I get out of this chart. 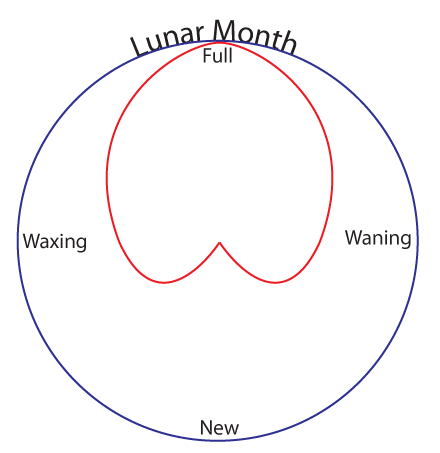 If there is some relationship between the natural cycles (day, month, year, turning) then what is the larger cycle outside of the saeculum? I have some ideas about this that I will put in another post, but I would love to hear readers thoughts and comments. 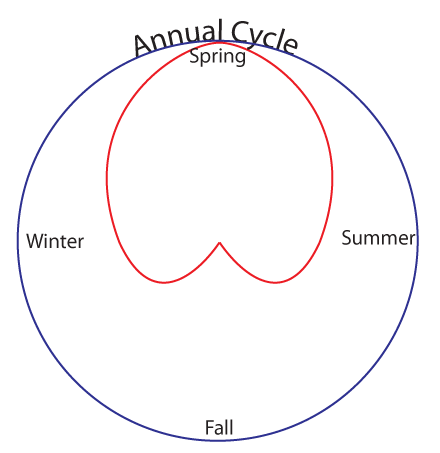 Also, I am not sure that I got the cycles lined up properly. 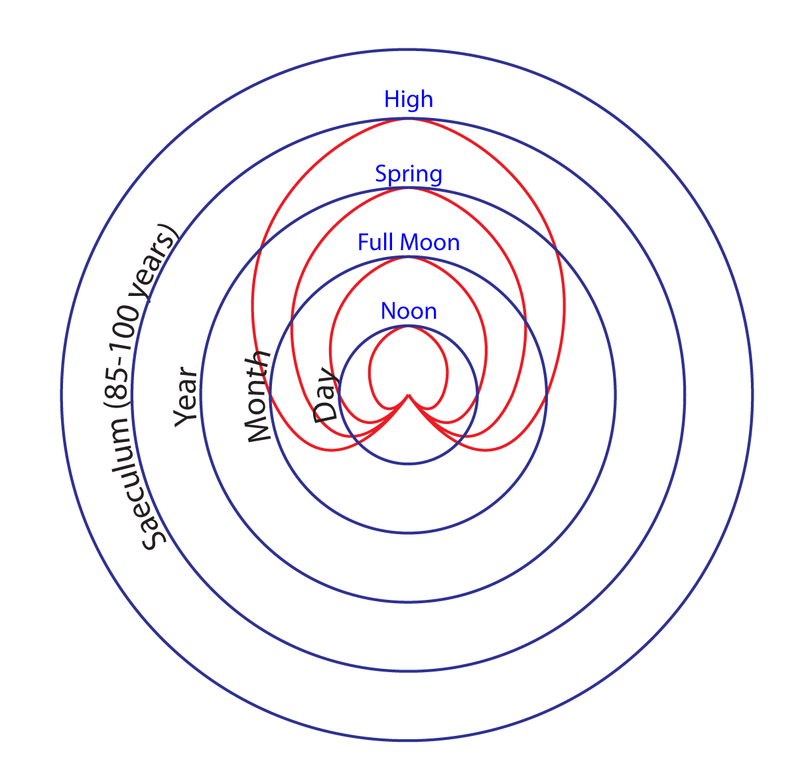 Spring goes with the Saecular High, but does that correspond to the Full Moon, and Noon? One thing I have noticed when I show this circular chart to people is that they are often puzzled by what it represents. Unlike the linear chart above, which makes sense to most Western thinkers, the use of a circular chart can be confusing, even though it shows the information in a much more coherent way. That is part of our linear thinking as well, and something I still struggle with. I still need to make the linear charts first before I can put them in a circle. I have several other circular charts that I will describe in later posts.